For some players the table limits quickly become bore-some and they would like to sit and play with some higher limits. If this sounds like you then Premium Roulette was designed with you in mind. 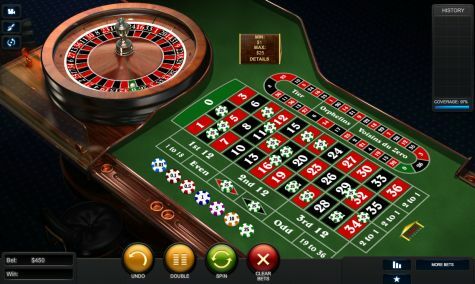 This version of Roulette was designed for the high rollers who play Roulette not only for the fun and excitement of the game but also to make a huge amount of money while playing the game we all love. Premium Roulette also gives players high roller options which is a nice perk and something that you should defiantly take advantage of while playing. Premium Roulette is Available in all formats of Roulette; American, European and French. You play this version the same way you would play any other version of Roulette. Premium Roulettes main and only difference is the table limits. The table limits are substantially more in Premium Roulette so this game is geared to the high rollers and whales of the Online Roulette world. The goal, as always with Roulette, is to predict where the ball is going to land and bet on it before the ball stops spinning around the wheel. If you predict correctly then you win the odds that go along with the option you bet on. Paddy Power Casino (Not available to Americans, but check out Roulette 5 at WinADay Casino instead. ): Premium French, Premium European and Premium American are available with the table limits being based on the players VIP Level. There are so many possible bets that can be made while playing Premium Roulette that it may seem overwhelming to new players. You are looking at playing Premium Roulette so I am assuming that you know how to play and play well. But if you are a new player who likes to bet big money while playing table games and would like to get to know how to play Premium Roulette then we have you covered. -Inside Bets are bets that the player places on the “Inside” of the Premium Roulette table. Numbers and Groups of numbers are Inside Bets. These bets are popular due to the high winning percentage. Basket – a bet on 0, 1, and 2; 0, 00, and 2; or 00, 2, and 3. The chip is placed at the intersection of the three desired numbers. Top Line – a bet on 0, 00, 1, 2, and 3. The chip is placed either at the corner of 0 and 1, or the corner of 00 and 3. Neighbors Bet: Bet on a number which covers the number itself and the two numbers on either side of it on the roulette wheel.